If you've ever decided to go for a cropped do then you know how terrifying it is, as sometimes it can go horribly wrong. 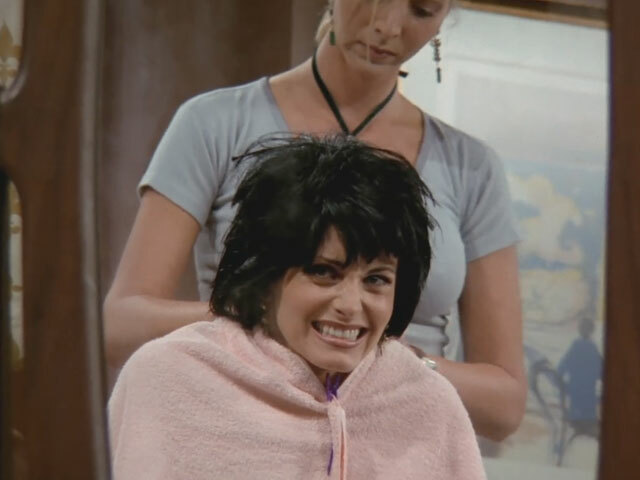 While you might be aiming for Twiggy circa the mid-1960s, you might just end up looking like that time Monica gets a terrible haircut from Phoebe in Friends. Yes, this did actually happen to us, and yes, we still have nightmares about it. Our own dreadful experiences aside, that doesn't mean we don't truly love a elfin crop. Unsurprisingly, there are many celebrities who've rocked a short style over the years, which is probably something to do with the fact they have access to some of the world's best hairdressers (we're not bitter, honest). From Emma Watson's dramatic cut post-Harry Potter to Kate Moss' iconic style, as well as Mia Farrow's classic Rosemary's Baby era 'do, we take a look at 25 of our favourites. When Jen, sorry, Michelle went for the chop, she transformed into chic fashion guru overnight. Sure, we loved her style before but those fewer inches really gave her the edge. Liv's is the ultimate 90s cropped do. This style is best for oval faces and those who possess larger features. The woman of the moment, Lupita Nyong'o has rapidly become the darling of the fashion scene, after she was photographed wearing that red Ralph Lauren gown with a cape. Her hair, of course, is her crowing glory and is just the right amount of volume. When J-Law debuted this haircut, we were, admittedly a little skeptical. Mainly because we loved her dark Katniss tresses. But it's grown on us (sorry) and now we love it. This is a more quirky crop so you've got to be brave to try this one out but Rooney Mara can of course carry this look off with aplomb. How cool is Helen Mirren? Don't answer that because we know you'll only say 'very'. Because of course she is. Very in fact. Just the best. And this cropped pink do proves exactly what we love about her. This was the look that meant pixie crops were cool. Cue thousands of girls wanting to go out and copy the exact look (we might have been one of them). Before this picture, former Doctor Who star Karen Gillan had actually shaved all her hair off, so what you're looking at is, technically, regrowth. Somehow, Karen has managed to make this look utterly stylish. We love it. If you've never tried rocking a quiff, then we insist you do that immediately. Halle Berry's cropped 'do was cute but with a tomboy edge, the ideal hairstyle to set off her delicate features.